Metro no. 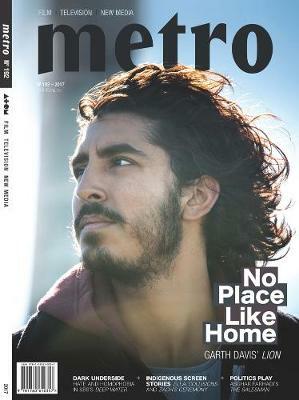 192 includes coverage of the feature films Lion, Joe Cinqu's Consolation and Boys in the Trees; TV series Rosehaven; Asian titles The Salesman, After the Storm, Three and Raman Raghav 2.0; and documentaries Zach's Ceremony, Baxter and Me and On Richard's Side. The issue also includes essays on Ella, Indigenous identity and ballet on film; and on Meal Tickets, authenticity and rock culture; as well as in-depth analyses of the virtual reality work Collisions, SBs' multi-platform project Deep Water, and the pre-release campaign for the Aussie classic Shine.